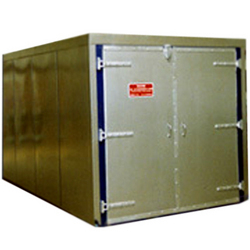 We are a leading Manufacturer of apparel curing ovens from Mumbai, India. We bring forth an excellent collection of Apparel Curing Ovens for our valuable clients. Used for different processing operations in different industries, offered ovens are highly acclaimed in the market. Manufactured under the guidance of professionals with superior grade components and sophisticated technology, our offered ovens are in line with industry. Moreover, offered ovens can be easily customized as per client's specifications.